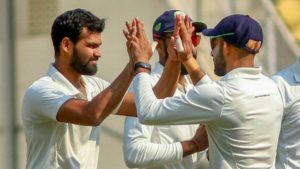 Defending champions Vidarbha beat Saurashtra by 78 runs on Day 5 of the Ranji Trophy final at VCA stadium in Nagpur to emerge as the champions for second year in a row. Chasing a target of 206 runs, Saurashtra’s quest for the maiden Ranji title was squashed as the team was bowled out for 127 runs even as Saurashtra batsman Vishvaraj Jadeja scored 52 runs. Aditya Sarvate, who turned the match in Vidarbha’s favour on Day 4 by picking up three crucial and early wickets, took another three wickets on Day 5 and took his wicket tally in the match to 11. Sarvate, rightly so, was declared as the player of the match during the presentation ceremony.